We are being teased here in the Midwest with beautiful days mixed in with some downright cold ones. Summer will eventually be here. It will finally be time to break out the sandals for the season. And oh yes, the espadrilles! I have always had a thing for a great pair of espadrilles. The classic shoe style with its iconic sole just says warm weather. They are timeless and work with just about everything in a summer wardrobe. The one downside of these quintessential summer shoes, is that they can sometimes be uncomfortable. With finicky feet, (translated to mean planters fascitis, high arches and bunions) I am constantly on the lookout for shoes that offer style and comfort. Espadrilles could never be considered the most comfortable footwear out there, but I am determined to continue to wear them. I did some rather extensive reading and research and found some that appear to be comfortable as well as stylish. (I need to be clear that everyone’s definition of comfort is not the same.) I am sharing a few of my favorites today! Soft taupe suede espadrilles ease from spring into summer. I just ordered this stylish shoe. They are also available in several other colors. The pair featured above is also available as metallic espadrilles. I consider metallic a neutral as it goes with all colors and patterns. Open sides lend a lighter feel to this summery pair of shoes. Tom’s is always a popular brand among many. The suede upper of these smoking slipper espadrilles looks especially soft and comfy. 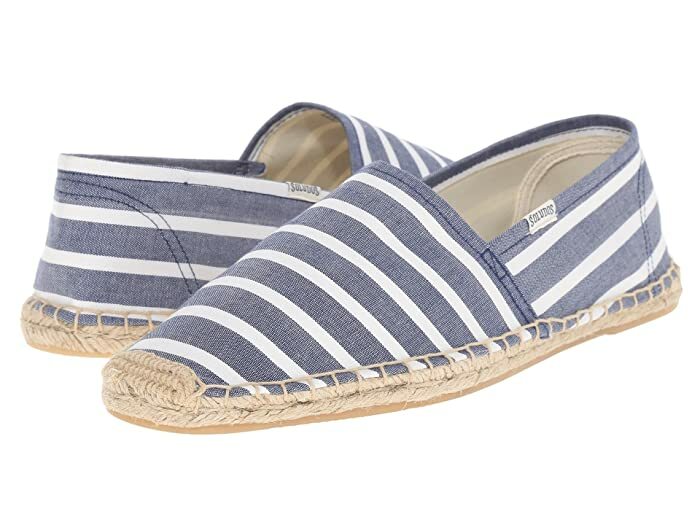 What says summer more than a pair of navy and white striped espadrilles with white denim? I see wearing these shoes while yachting off the Cote De Azur! Okay, I’m daydreaming. Although spendy, they are chic! I love the colorblock styling of this tory burch shoe. A mule in soft leather adds a sense of chic to a casual outfit. And just think, no heel rubbing. Superga sneakers have a reputation of being very comfortable. So, why not add a braided raffia platform sole? My very favorite espadrille look includes laces around ankles. The woven back and laces allow for a custom fit for various ankle sizes while securing the shoe to the foot. I have these espadrilles in the linen color. Without a doubt, they are one of the most comfortable sandals I have ever owned. The stretchy bands conform to my foot perfectly and the suede sole is cushioned. Also by Charleston shoe company, try a comfy espadrille slide in a multitude of colors. I plan to order the black pair. Toni Pons is a well known Spanish designer of espadrilles. I love the elastic sling back and padded footbed for comfort on these mid heel wedges. I’m showing navy linen here, but choose from 5 other colors. A stunning fabric wedge elevates any summer wardrobe. Soft suede and a higher wedge define this open toed sandal. Elastic secures your ankle while a cushioned soul protects your feet in this comfy sandal. Slide into these sandals with a soft leather upper. Ahh, just writing this post allowed my mind to drift to thoughts of summer. Do you own espadrilles? If not, you need them! If so, there is always room for one more pair!